After hanging up his boots and leaving active duty in the military, the Rev. Gary Linsky has traded his position as an Air Force colonel and chaplain to serve as priest of St. Peter’s Catholic Church on Assembly Street. He says his duties now are the same as ever, even if the context is a little different. For the Rev. Gary Linsky of St. Peter’s Catholic Church, Sunday Mass in a sanctuary is relatively different territory. Linsky spent three Easters in Afghanistan, a far cry from the quiet at St. Peter’s Catholic Church on Assembly Street where he is now pastor. Before becoming pastor at St. Peter’s, the Rev. Gary Linsky served as command chaplain at Scott Air Force Base in Illinois. Linsky joined the church in August after retiring as an Air Force colonel and chaplain. Last Easter he was in Afghanistan using glow sticks for candles. Linsky said it was instances like these that have made him keep his humility. Linsky has also been stationed in Jordan, Iraq, Afghanistan, Qatar and Oman in his seven overseas deployments. He also was part of the Defense Department’s task force evaluating the effects of the “Don’t Ask, Don’t Tell” policy, now abandoned, on gay service members. “We were trying to do the right thing for our country,” he says. “Our work wasn’t intended to be political,” and he says it is hard to say if it helped or hurt his position as chaplain. Linsky, who grew up in State College, Pa., and attended Penn State, spent 32 years in the military, 25 on active duty. 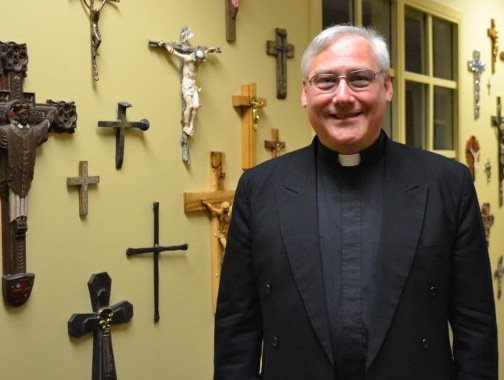 He served in the National Guard and then worked as a hospital administrator in the Air Force before deciding to go to seminary in Philadelphia in the early 1990s. He was ordained a deacon in St. Peter’s Basilica in Rome. Linsky said he has seen his share of tragedy, but that it is important to keep your humility and remember your humanity. In all things, Linsky said, he tries to instruct others about how Christianity can be a powerful tool for relations and a safe harbor for the spirit. Columbia Voice talked to Linsky more about the intersection of the military and religion. The interview has been edited for length and clarity. You served in the military as a chaplain colonel. When you were young, what was most important, love for your country, or love for God? Well that’s an interesting question. I’m glad you asked it. When I was young, I think my priority in one sense was more military. I started out in the Air Force as a hospital administrator. I went through ROTC at Penn State. But for me, being spiritual, or being religious and being in the military was not something that was either/or, it was always both/and. So I think I was very involved in my faith life while I served in the military, and it was­ while I was in the military, at an overseas location, that I found the call to become a Catholic priest. So really they went very much hand in hand. As a colonel and chaplain, the Rev. Gary Linsky was responsible for ministering to many service members of different religions. As command chaplain of the Air Mobility Command, Linsky oversaw the religious and spiritual care of 132,000 people at 12 locations across the U.S. So with your experience in the military, it led you even more to religion? So would you say that this is a common misconception for Christians? I would say that often times, Christians today are cowed, and they have become fearful. … There is the desire of many who do not practice any religion to be antagonistic towards those who do, as if their mere presence, their mere assertion, their mere desire to be people of faith is offensive. And you know, we have to enter in this country into a dialogue of mutual respect. … We have to have that mutual respect. I think, sometimes, our country is sadly so polarized, from the left and the right, you know, we Catholics fall on both sides of the divide. … And so how we work that out leaves us sometimes caught in the middle – and maybe that’s really where we should always be, someplace in the middle. Since you did serve as chaplain colonel, did anyone ever disrespect your position, as a religious leader or spiritual leader? While I’m sure not everybody agreed with me. … You know, we always sought to guide them and structure these things so that their rights were protected. … You know, in terms of disrespecting me, probably not; I think I was really very blessed in the military to have had an excellent rapport with people from a wide perspective of backgrounds, whether they were people of faith, or not of faith. But I did hold, I think, the line, in terms of insuring that the free exercise privileges were protected and free speech rights as well, because that was my duty … we worked to safeguard those things. Did everyone agree with me? If they did, I’d be a little surprised, but I didn’t do too badly. The Rev. Gary Linsky, who was ordained a deacon in St. Peter’s Basilica in Rome, says Christianity should permeate a Christian person’s identity. He says faith should be lived daily, not just on Sunday. Although you were a noncombatant, war and conflict obviously test the human spirit and your beliefs and everything you know about life. Were your beliefs, your Christian beliefs, ever threatened by what you experienced? My Christian – my faith was never questioned, or stressed in that manner. I have to say, I think one of the hardest times for me was where I served as the wing chaplain of our military wing at Balad Air Base in Iraq. At that time I was the only priest for about 7,000 Air Force personnel, and then later when an Army priest became ill and was sent home, for six weeks I was the only priest for over 30,000 military personnel at a location that had the largest field hospital in Iraq. At that time, we had just completed the battle of Fallujah, there were casualties flown in every day, and they were ugly casualties. … After going to the hospital daily, to anoint and to visit and just to say hello, it took its toil. Not on my faith, but I think it, it took its toil in a different sense, it was like Post Traumatic Stress – you become just exhausted, having to see the type of effects of just brutal violence, and you know, our heart goes out to the people of the Middle East and their internecine war between different really predominantly Islamic sects that have hid behind violence in the name of religion. And yet, in the name of religion it’s evil; murder is murder. … I would always go, when there was a need. But I just wouldn’t go routinely, because it began to be too painful. … Did it reflect negatively on God – absolutely not. … But it was a choice, and that choice brought a lot of this evil into the world, and unfortunately, we see it every day in our city, and in the world, it just happens – and a place like Iraq and Afghanistan it just seems like you see far too much of it.